Wait until you see what else Puerto Vallarta has in store. Photo by Jenny Hannah Roche. Writer and editor Felisa Rogers was raised to avoid tourist meccas like Puerto Vallarta. So why on earth is she raving about it? A change of attitude, an eye for local fare, and a thirst for cold microbrews led her to discover that authentic gems and commercial beachside resorts can exist side by side. PUERTO VALLARTA, Mexico – Puerto Vallarta. A name that once conjured visions of margaritas and whispering palms, red tiled roofs, Liz Taylor in a bikini, The Night of the Iguana. Now, like anywhere in Mexico, there's the taint of narcotraficantes, SUVs with blacked-out windows, the blood-drenched corpses of the drug war that's been tearing Mexico apart since 2006. But never fear. Here's the deal: Unless you're planning on buying or selling drugs in Mexico, you're extremely unlikely to find yourself in grave danger. Since the troubles began, I've driven Mexico from end to end several times and never had a problem. Sure, that's anecdotal evidence, but the numbers back me up. A Texan is more likely to get killed in Texas than in Mexico. And Mexico's drug violence is distinctly regional. You want scary? Think Michoacan. Vallarta, on the other hand, is not a cartel hotspot and tourists are not typical cartel targets. So when my editor asked me to write a piece about Vallarta for a special on places people are scared to travel to, I almost chuckled. Vallarta, scary? But then I remembered. I used to be scared of Puerto Vallarta, too. The author and her parents, southbound. Photo courtesy of Felisa Rogers. 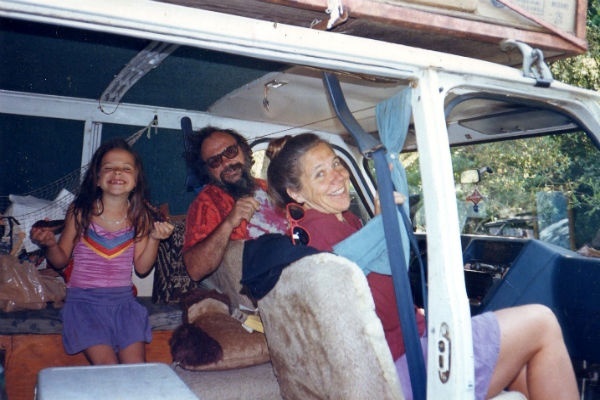 You see, my parents were crazy hippies, legends even. My dad, Steve Rogers, was coauthor of a book called The People's Guide to Mexico, a 1970s cult classic that inspired legions of hippies to pack their vans and head south. We were at the head of the pack: I spent my entire childhood traveling Mexico by van. My parents were obsessed with out-of-the-way places. We'd drive seven hours up a looping dirt road with potholes the size of bathtubs to visit a Oaxaca village where gringos might as well have been aliens from another planet. We ate menudo and iguana and grasshoppers because that was the adventurous thing to do. We camped in garbage dumps and the parking lots of whorehouses because nice hotels weren't part of my parents' ethos, an ethos that they deeply ingrained in their only child. I was raised to believe in the difference between tourists and travelers, raised to follow the rules that would keep you on the right side of that equation. A traveler didn't eat at Americanized restaurants; a traveler ate at market stalls or roadside stands. A traveler spoke the language. A traveler stayed in the sketchy neighborhood. A traveler was willing to suffer any discomfort or indignity to enjoy an authentic experience. And most of all a true traveler, or Mextripper, never lingered in a resort town like Puerto Vallarta. My only childhood memories of Puerto Vallarta involve my parents cursing as we drove through town on our way south. My parents hated the giant high-rise hotels, the traffic, and, later, after NAFTA, the McDonalds, and the Walmarts, and the Outback Steakhouses. In my twenties, I rebelled against my parents' cheapskate ethos, their obsession with authenticity. If I had money, I spent it. I'd fly into the Vallarta airport en route to the beaches further south. Vallarta was a necessary stopover, nothing more. I'd stay in the pretty Hotel Yasmin located in the gringo district of Old Vallarta, eat at a fancy restaurant, grab a drink or three at a beach bar. But despite my willingness to spend money like a real tourist, to indulge for one evening in the experience that Vallarta offered to millions of sun-hungry travelers, I still dreaded my stops in Vallarta. Everything moved too fast. The tourists were rude. The waiters were rude. The hustlers were rude. Everything was overpriced. The experience felt hollow. It wasn't the Mexico I was looking for. Now that I'm older and wiser, I realize that the fault was all mine. Unable to shake my ingrained distaste for tourist towns, I was going into Vallarta with my shoulders hunched, expecting to find scams, tourist traps, ugliness. So I did. These days I take a different approach. I now approach Vallarta with a smile, secure in the knowledge that I'm in Mexico and therefore I'm sure to find something interesting. You can still adventure off the beaten path, even in a tourist destination. And with that attitude, I've gained a fondness for the town. Take to the old town. Photo by Felisa Rogers. Located on the border between the great state of Jalisco and the great state of Nayarit, Puerto Vallarta is perched on one of the most beautiful coastlines in the world. The old part of town, or Viejo Vallarta, hugs the south end of Banderas Bay. The streets are narrow and paved in brick and cobblestone; red tiled roofs dot the jungled slopes of the sheltering mountains. 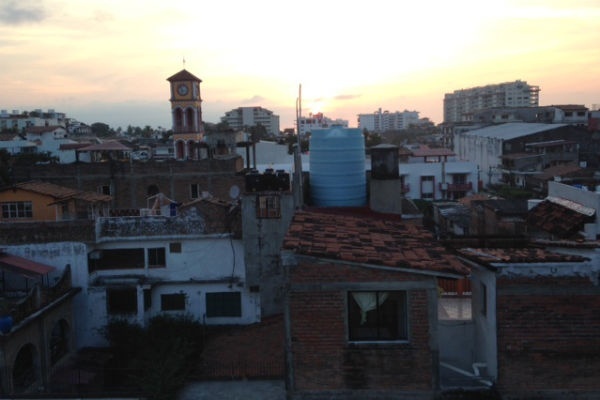 To the north of Viejo Vallarta is Nuevo Vallarta, or New Vallarta, the sprawl of high rise hotels and box stores my parents so deplored. But never mind that. Viejo Vallarta is where you want to be. You see, Viejo Vallarta has a little something for everyone. This is perhaps the easiest section for me to write, because ingrained habits are hard to shake. Despite my profligate twenties, I'm back to the old mode of travel. And I've discovered that Puerto Vallarta has much to offer to the budget traveler. If you head east from the beach on Calle Francisco Madero and cross Calle Constitucion, you'll find an entire district of budget hotels. I like Hotel Villa del Mar. A classic Mexican hotel, it's cheap, it's clean, and it has a nifty rooftop sitting area that's perfect for a sunset drink. There's no bar, but the corner store stocks ice-cold Victoria. In the morning, nearby stands serve the perfect start to a day in Mexico: a tall glass of fresh-squeezed orange juice for the delightfully low price of ten pesos (about 80 cents in USD). Crowded with tiendas, mom-and-pop dry goods stores, nail salons, florists, cafes, and hole-in-the-wall bars, this neighborhood has the advantage of being wonderfully Mexican yet within walking distance of important tourist commodities like a decent cup of coffee. 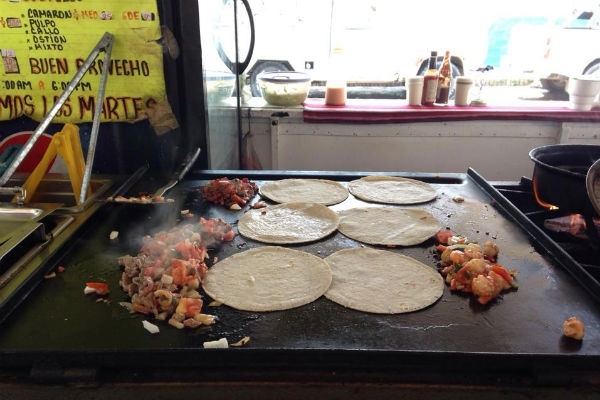 As a bonus, some of the best taquerias in town are on Calle Madero. The before shot at Taqueria Morenos. Photo by Chelsea McCalister. Imagine this: A crispy fried chile relleno. Stuffed with shrimp. Topped with tangy sauce and stuffed inside a taco. You can have your chile relleno taco and more at Mariscos el Moreno on Calle Madero in the hotel zone. Next door is another taco stand, also called Taqueria Moreno, which serves equally delicious beef and pork tacos. Homemade tortillas, hot and tender off the grill, crunchy cabbage, fresh cilantro, delicious, delicious pork al pastor and smoky carne asada. These taquerias are just two of many fine establishments that decorate the street corners of Vallarta, serving food so cheap and delicious that I always want to stay an extra day just to belly up to the counter and sample another round. You probably already know that Puerto Vallarta is one of the premier gay tourist towns in the world, with a gay Riviera (a.k.a. Romantic Zone) located south of the river. Establishments with names like Spartacus Club for Men share the block with swanky cocktail bars, condom stores, gyms and spas, and even gay-oriented pizzerias and sports bars. Gay-friendly tours abound, offering everything from bar hopping to whale watching. As a lady, I'm not the best guide to Vallarta's gay male scene, but I did enjoy La Noche, which, as mentioned, serves good tequila at reasonable prices on a tastefully lit rooftop. Note: In Vallarta, things don't get swinging until late. In most clubs, you won't find much going on until well after 11 p.m.
Mexican microbrews. Revenge IPA. Photo courtesy of Los Muertos Brewing. 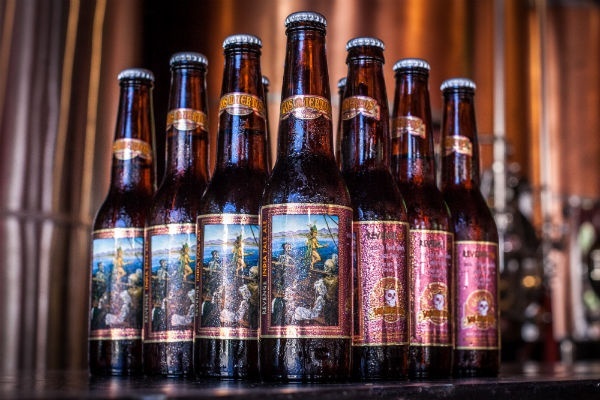 You may be aware that Mexico is in the midst of a beer Renaissance. Puerto Vallarta is in on the game. Los Muertos Brewing is an American-style brew pub with a friendly staff, a pleasant ambiance, and tasty local brews such as Anillo de Fuego Chile Ale and Mexicana Rubia Blonde. I stopped in for a Revenge Pale Ale and stayed for a Hop On American Ale while chatting with the knowledgeable bartender. After a month of drinking swampy Pacifico, the crisp and complex beer was a welcome change of pace. Check out the Centro Botanero Rincon de la Tia, a pleasant dive that offers a giant plate of free ceviche with your round of extraordinarily cheap beer. Booming jukebox, Mexican decor — check those off your list. Locals wondering what the hell this gringa is doing drinking in their bar? Yeah, check that, too. Vallarta is home to a number of good coffee shops, but the best espresso I've found is served at Cafe del Mar. The cafe's gallery ambiance doesn't really do anything for me, but the barista is a friendly wizard, and that's what counts. A shady park borders the river, replete with a picturesque swinging bridge. In recent years, the Rio Cuale has undergone a remarkable clean-up effort and is now amazingly clear, especially for a body of water running through the center of a major Mexican town. Still feel like walking? A visit to Vallarta isn't complete without a stroll on the town's famous Malecon, a boardwalk that runs along the beach downtown. Buy some food on a stick, watch the sun go down over the sea, and revel in what it took me 30 years to realize: Sometimes being a tourist isn't such a bad thing after all. 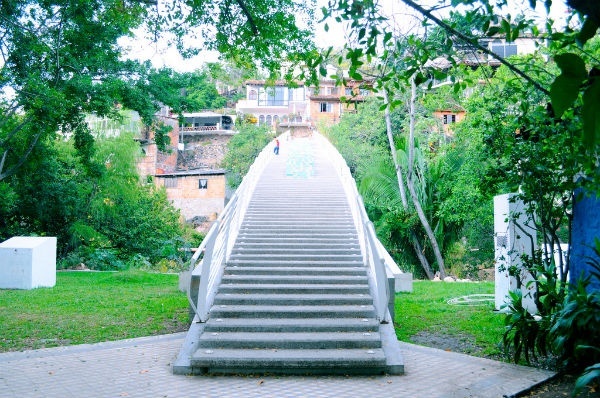 Downtown Puerto Vallarta is 15 minutes from Licenciado Gustavo Díaz Ordaz International Airport, and is accessible by minivan (Combi bus) or taxi. Felisa is a writer and editor for The People's Guide to Mexico and thepeoplesguidetomexico.com. She travels for the tacos.